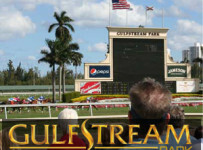 Gulfstream Park has a ten-race card on Sunday, with first post at 1:15 p.m. The feature, with several stakes-caliber runners, is the third race with scheduled post of 2:17 p.m. 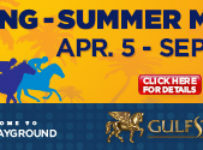 It is a $62,500 allowance/optional claimer at one mile on dirt for 3-year-olds and up, with a $44,000 purse. The Sunday card will follow a Saturday that was highlighted by Keystoneforvictory’s win in the $75,000 Forty Niner Stakes at 1- 1/16 miles on turf for 3-year-olds (photo on home page, with jockey Rafael Hernandez). Five of Sunday’s races (the even-numbered ones) are scheduled for turf. The dirt track is listed as fast and the turf is listed as firm. According to the Weather Channel, the chance of rain ranges between 25 percent and 60 percent during racing hours. The carryover is $41,747 on the Rainbow 6, on races five through ten. Southern Barbecue and Rich Daddy are likely favorites in the third race, which has six entrants. Rich Daddy has three wins in four starts this year. His only loss was a sixth place finish in the Skip Away (Grade 3) at Gulfstream on April 2. That 1 1/8 mile race was on a sloppy track. Rich Daddy has five wins in seven career starts at one mile on dirt. Emisael Jaramillo will ride Rich Daddy, owned by Winds of Change Racing Stable. Sunday’s race will be the first for Southern Barbecue since last Nov. 7 when he finished third in the Millions Classic Preview. 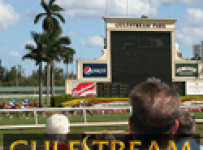 That 1-1/16 mile dirt race was run at Calder during the Gulfstream Park West meet. Southern Barbecue, a 4-year-old, had a win and four other in-the-money finishes in seven starts in 2015. The race also will be Southern Barbecue’s first for trainer Mark Casse. In April, Jacks or Better Farm transferred all of its approximately 15 horses including Southern Barbecue from Stan Gold to Casse. That ended a very successful 10-year partnership between Gold and Jacks or Better. Wildcat Wish, trained by Gold, is also in Sunday’s feature and has two wins and two second place finishes in his last four starts. The 3-year-old gelding is among about a dozen horses whose owners have switched to Gold following trainer Bill Kaplan’s retirement in April. Wildcat Wish has never raced longer than seven furlongs on dirt. But he had an impressive late-running win at that distance at Gulfstream on May 6, indicating he could be able to stretch out to a mile. Eddie Castro will ride Wildcat Wish for owners Jack Hendricks and Roger Justice. Casse has selected Rafael Hernandez to ride Southern Barbecue. Casse also will send out Piloting, a horse that likely will seek the early lead. Tyler Gaffalione will ride for owner Westbury Racing. Hy Kodiak Warrior and Joshua’s Comprise also are in the field. We will have updates during the afternoon on our blog. Keystoneforvictory took the lead entering the first turn and was never headed as he went on to win the Forty Niner Stakes. Keystoneforvictory, the even-money favorite, beat Tizzarunner by 3 ¼ lengths in the 11/16 mile turf race for 3-year-olds. Fleming finished third, another half-length back in the nine-horse field. Rafael Hernandez rode the colt Keystoneforvictory, who won in the fast time of 1:40,15 on the course listed as firm. It was Keystoneforvictory’s first stakes victory and fourth win in eight overall starts. He is a son of prominent turf sire Shakespeare. Mike Maker trains Keystoneforvictory for owners Ken and Sarah Ramsey. The win was the first for Hernandez in more than four months. He returned to riding on Thursday after recovering from injuries sustained in a spill at Gulfstream on Feb. 20. He broke a collarbone, fractured some ribs and needed to have a kidney removed.